Researchers using nanotechnology and materials engineering have discovered a new type of lighting material that is safer, more durable, and lasts longer. Field-Induced Polymer Electroluminescent technology (FIPEL), may replace conventional lighting in the future. In Popular Mechanics' list of 101 Gadgets That Changed the World, the light bulb was ranked number 10. The light bulb provided constant illumination to the world and transitioned the dependence of light from the open flame to electrically produced light. 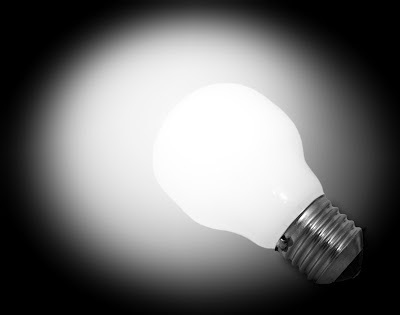 The light bulb works by passing an electric current to a filament (usually tungsten). This allows the tungsten to heat up and glow, producing light. To protect the filament from oxidizing and burning out, it is encased in a glass bulb which is filled with non-reactive gas like argon. This lead to the development of the fluorescent lamp which although also has a filament, uses atoms to generate ultra violet light that excites the phosphor (a chemical that can emit light) coating inside the tube to light up. The filament is used to heat up the mercury atoms for it to start generating ultra-violet light which in itself is invisible to the naked eye. Other developments in lighting technology led to the creation of LED light (using diodes). LED lighting uses electrons to release light energy in the form photons. LED lights need a semiconductor to regulate and control the process and usually lasts from 10,000 hours to 25,000 hours. An LED light is small (around 1 mm2), so to have enough LED lights to illuminate a room is a bit costly. Prior to FIPEL, OLED (Organic LED) is being looked at as the next step in lighting technology. Scientists at Wake Forest University have developed a flicker-free, shatterproof alternative for large-scale lighting. "People often complain that fluorescent lights bother their eyes, and the hum from the fluorescent tubes irritates anyone sitting at a desk underneath them," said David Carroll, the scientist leading the development of this technology at Wake Forest. "The new lights we have created can cure both of those problems and more." This new lighting solution is at least twice as efficient as compact fluorescent (CFL) bulbs and on par with LEDs, but these bulbs won't shatter and contaminate a home like CFLs or emit a bluish light like LED counterparts. 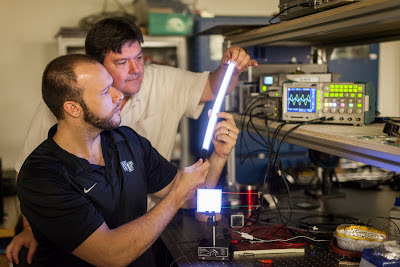 Wake Forest University physics professor David Carroll works with graduate student Greg Smith on new FIPEL lighting technology. "If you wanted blue lights, discos would still be popular. You want lights that have a spectral content that is appealing to us inside of a building," Carroll said. "You want a light that won't shatter and create a hazmat situation while your children are around." Carroll is the Director of the Center for Nanotechnology and Molecular Materials at Wake Forest University. Center scientists have developed innovative technology including highly efficient plastic solar cells; Power Felt, a fabric that can use body heat to charge small electronics; and a combination solar-thermal heat pump.